Android 6 Location Services and Bluefruit LE « Adafruit Industries – Makers, hackers, artists, designers and engineers! Android 6.0 slipped in some easy to overlook changes concerning Bluetooth Low Energy. 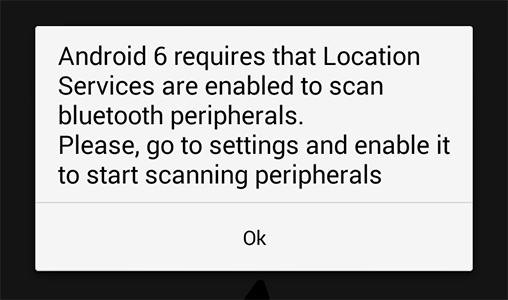 If Location Services are disabled on your Android devices, applications like Bluefruit LE Connect won’t be able to scan for nearby Bluetooth Low Energy devices. The changes are security related, and are intended to prevent people from tracking individuals via Bluetooth Low Energy MAC addresses. If you don’t see your Bluefruit LE devices after upgrading to Android 6.0, this is the most likely explanation. To scan for devices, enable Location Services on your device and restart the Bluefruit LE Connect application. Location Services can’t be enabled at the app level for security reasons, so you’ll need to do this yourself, but in the latest version of Bluefruit LE Connect (1.1.4+) we do detect if they are enabled at startup and display a helpful reminder asking you to enabled them.